Today’s motorcycle is the result of 200 years of invention and technology. The history of motorcycles is a fascinating trip, and we’d like to share some of the highlights. 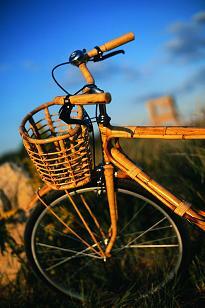 The ancestor of the motorcycle is the humble bicycle. The first bicycles in the early 1800s were made of wood, and riders literally walked them along—good exercise, but not a fast mode of transportation. Bicycles weren’t chain-driven until the late 1860s, and the first steam-powered bicycle, the velocipede, was patented in 1866. Powering cycles with something other than human power had already occurred to some inventors, and through the 1800s, they came up with dozens of cycles with two, three, and four wheels powered by gas and steam. By the end of the century, motorized tricycles were common, but some areas enforced speed limits and other restrictions. As with many “firsts” in technology, there is some debate about who built the first motorcycle. Inventors mentioned in the discussion include Sylvester Roper and his steam-powered bike, Michaux with a single-cylinder bike, Lucius Copeland and his three-wheeled steamer, and Daimler and Maybach with the Reitwagen, powered by an internal combustion engine. An early motorcycle from Royal Enfield had a 239 cc front-mounted engine that powered a belt to the rear wheel. While early motorcycles tended to be two-stroke, the four-stroke engine soon replaced it. After the breakthrough combustion engine, it was possible to mass produce motorcycles, and The Hildebrand & Wolfmuller made its debut in 1894. 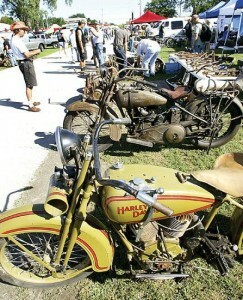 Companies such as Triumph, Indian, and Harley-Davidson soon followed. Once motorcycles were mass-produced, technological advances occurred regularly. Tires, engines, and transmissions continued to evolve, and the motorcycle lost the old moto-bicycle look and morphed into the design we recognize today. 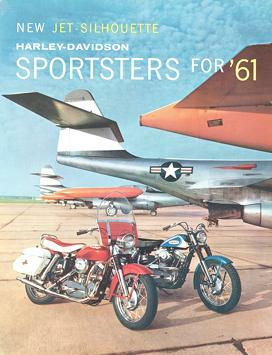 Motorcycles soared in popularity during the first decade of the 20th century. By the time World War I began, motorcycle manufacturers were building thousands of bikes a year, and soldiers used them regularly during the war. While the Great Depression affected motorcycle companies, advances and leaps in technology continued, with engines becoming larger and more powerful. Body designs were streamlined, and in the ‘40s and ‘50s, more companies entered the market, such as Honda, Kawasaki, and Yamaha. Through the rest of the century to the present, manufacturers have focused on continuously upgrading the bike as a whole. Advances have included diesel engines, wind protection, antilock brakes, left-side gear change, and aesthetic improvements such as metallic paint and neon kits. Motorcycles are now safe, speedy, and comfortable. As Sullivan’s Island motorcycle accident attorneys who also ride, we’re fascinated by the history of motorcycle technology. What’s your favorite point in motorcycle history? Visiting motorcycle museums is a fascinating walk through the timeline of motorcycle history, with an incredible array of bikes, memorabilia, and publications on display. Many motorcycle museums are directed by nonprofit foundations and hold special motorcycle raffles at least once a year. Following are four museums you don’t want to miss. Image to the left taken from the Motorcycle Hall of Fame website. 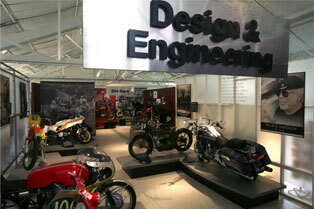 The Motorcycle Hall of Fame Museum opened in 1990 in Westerville, Ohio. In 1999, it moved to Pickerington, Ohio, the home of the American Motorcycle Heritage Foundation. Not only does the AMHF run the museum, but it also preserves motorcycling’s history, participates in research, and creates educational programs. The museum features exhibits on dirt racing, Ohio-made Hondas, and classic bikes. The Hall of Fame exhibit celebrates prominent figures in motorcycling, and the Founders Hall recognizes those who contributed to the museum. The museum is open 9 a.m. to 5 p.m. seven days a week, and is closed New Year’s Day, Easter, Thanksgiving Day, and Christmas Day. Founded in 1989, the National Motorcycle Museum is located in Anamosa, Iowa, and is open seven days a week. During the summer, its hours are Monday through Sunday 9 a.m. to 5 p.m., and during the winter, it is open Monday through Saturday from 9 a.m. to 5 p.m. and Sunday from 10 a.m. to 4 p.m. The museum is operated by a nonprofit entity and has over 300 motorcycles on display. Exhibits include the lives of Arlen Ness and Evel Knievel, motorcycle movies such as “Easy Rider,” and antique motorcycles and other vehicles. A visit to the website’s tour page gives you just a glimpse of the incredible displays. Image to the left taken from the Wheels Through Time Museum website. Located in Maggie Valley, North Carolina, the Wheels Through Time museum displays over 300 American vintage motorcycles from manufacturers such as Harley-Davidson, Indian, Henderson, and Excelsior. Other exhibits include a chopper graveyard, board track racing, and police motorcycles. The museum houses tens of thousands of motorcycle photos, parts, artwork, and artifacts. Founded in 1993, the museum is open Thursday through Monday from April through October, and its gift shop sells clothing, posters, DVDs, and other memorabilia. The website offers videos, virtual tours, and glimpses behind the scenes. In 1989, George Barber wanted to preserve global motorcycle history and began collecting motorcycles and other vintage vehicles from around the world. In 1995, his collection opened to the public in Birmingham, Alabama, and today the museum has over 1200 motorcycles as well as rare and unusual cars, including the largest collection of Lotus racecars in the world. The Barber museum is open year-round, closed only on major U.S. holidays. It holds special events such as the Barber Vintage Festival, a celebration of all things motorcycle, including a parts swap meet and motorcycle auction. The Barber Motorsports Park in Birmingham holds shows and events from spring through fall, and the Barber Vintage Museum Library holds over 6,000 books and motorcycle magazines. Have you been to one of these museums, and what was your favorite exhibit or memorabilia? As South Carolina motorcycle accident attorneys, we always find the innovations in safety particularly fascinating. Image to the left taken from qctimes.com. Motorcycles have come a long way since the steam-powered bicycle, or steam velocipede, was patented in the US in 1866. It looked just like a bicycle with an engine, and motorcycles had this basic design for years. By 1868, the velocipede had two cylinders and its own coal-fired boiler. Later, three-wheeled “Moto-Cycles” and steam-powered tricycles made an appearance, and handlebar controls came into use. The United States was not the only country racing to create motorcycles. In 1885, Gottlieb Daimler and Wilhelm Maybach invented a single-cylinder, gasoline-powered two-wheeled vehicle called the Daimler or the Reitwagen, which is commonly recognized as the first true motorcycle. Daimler’s bike had a wooden chassis and wheels with iron rims and wooden spokes. Several years later, Alex Millet’s motorcycle had pneumatic tires and a five-cylinder engine. Before 1900, scores of motorcycle designs emerged from Europe and the United States, and most utilized the internal combustion engine. Few were available to the public for purchase at this time. As you might expect, these motorcycles had low compression and not much power, but they were exciting. One of the earliest motorcycles from bicycle maker Royal Enfield had a 239 cc front-mounted engine that drove power through a belt to the rear wheel. While some early motorcycles were two-stroke, the four-stroke engine known as the Otto Cycle became popular. In 1898, Triumph, also an English bicycle manufacturer, began building motorcycles and the Metz Company of Massachusetts began building the Orient-Aster. A few years later, Harley-Davidson and Indian entered the U.S. market. Indian’s first model was diamond framed with an American-made engine and was painted its trademark red color. As interest in motorcycle sports grew during this time, so did innovation, and the design of the bike started evolving away from its motorized-bicycle look. By the time World War I started, motorcycle companies were producing thousands of bikes a year, and many were put to good use during the war. After the war ended, BMW came on the scene with motorcycles that were equipped with a shaft drive and a horizontally opposed boxer engine housed with the transmission. Image to the right taken from motorcycleclassics.com. Even though the Depression impacted motorcycle companies, Ariel introduced a 1000 cc bike, and Matchless made great technological strides with their V-4 593cc Silver Hawk. In 1934, the OHV Meteor engine was introduced, which was capable of 90 mph. Two years later, the V-twin 998 cc engine achieved speeds of over 100 mph. A new land speed record of 136 mph was set on a modified 1000 cc OHV Harley. In the 1940s, Honda was founded, and Harley-Davidson replaced their knucklehead engine with the panhead engine and introduced the Hydra-Glide and its new front end. Vincent’s Black Shadow and Black Lightning reached speeds of over 125 mph. During the 1950s, Harley’s FL received a new frame and swinging arm plus a new name—Duo-Glide. Kawasaki, Suzuki, and Yamaha entered the market, and the British manufacturers declined. The 250 cc motorcycle came of age in the ‘60s with Ducati’s Mach 1, the fastest in its class. Suzuki contributed a two-stroke twin T series engine, and after 1966, their engines were auto oil injection. Harley’s Duo-Glide received an electric start and changed its name to Electra-Glide. Norton’s bikes used a new rubber mounting system to reduce vibration, and Kawasaki introduced a three-cylinder, two-stroke machine. Yamaha’s latest bike had an SOHC parallel twin cylinder engine. During the 1970s, manufacturers upgraded their engines, and Suzuki introduced several three-cylinder models, while Kawasaki added a four-cylinder SOHC engine. Other innovations included desmodramic valves, autolube systems, full fairing, and left-side gear change. In the ‘80s, Harley-Davidson introduced the Softail model, some bikes receive wind protection, and a major technological leap was antilock brakes on the BMW K1 bikes. The end of the 20th Century and the beginning of the 21st Century saw a rotary engine bike, the Harley Evolution engine, and the first production diesel-powered motorcycle. Motorcycles continue to evolve technologically and aesthetically. As Goose Creek vehicle accident attorneys, we’re fascinated by changes in motorcycle technology. If you had to choose the most significant advance in bikes, what would it be, and why?